We found this little lovely in Bon Appetit magazine a few years back when we were planning Thanksgiving. She’s never disappointed us. I’ve made a few [minor] changes to the recipe, but one thing stays the same: bourbon + sugar = Fall Food Fantasy! The great and best thing about this recipe is that you can throw everything into a Kitchenaid mixer or a biggo bowl and just whip away! It comes together beautifully and the cooking technique is perfect. Easy peazy. Sift 1½ cups flour and salt in a medium bowl. Using your fingertips, work in butter until mixture is crumbly. Mix in 2 tbsp. cold water and knead until dough just comes together. Roll out dough on a lightly floured surface until about ¼” thick. Fold in half, then in half again (so that it’s folded into quarters); roll out to a 12” round. Transfer to a 9” pie dish. Press the crust into the pie dish so that all the sides are covered with dough (wouldn’t want to waste a good thing, right?) Prick the bottom of the dish all over with a fork to allow for even cooking. Throw into the freezer while you make the filling. Place a rack in lower third of oven; preheat oven to 425°. Cook butter in a small saucepan over medium heat, stirring often, until it foams, then browns, 5–8 minutes. Transfer to a large bowl or mixing bowl of a standing mixer. While still warm but not hot, whisk in brown sugar, honey, cane syrup, bourbon, vanilla, nutmeg, and cinnamon until smooth. Add eggs, one at a time, mixing well to combine. Gently mix in the pecans. 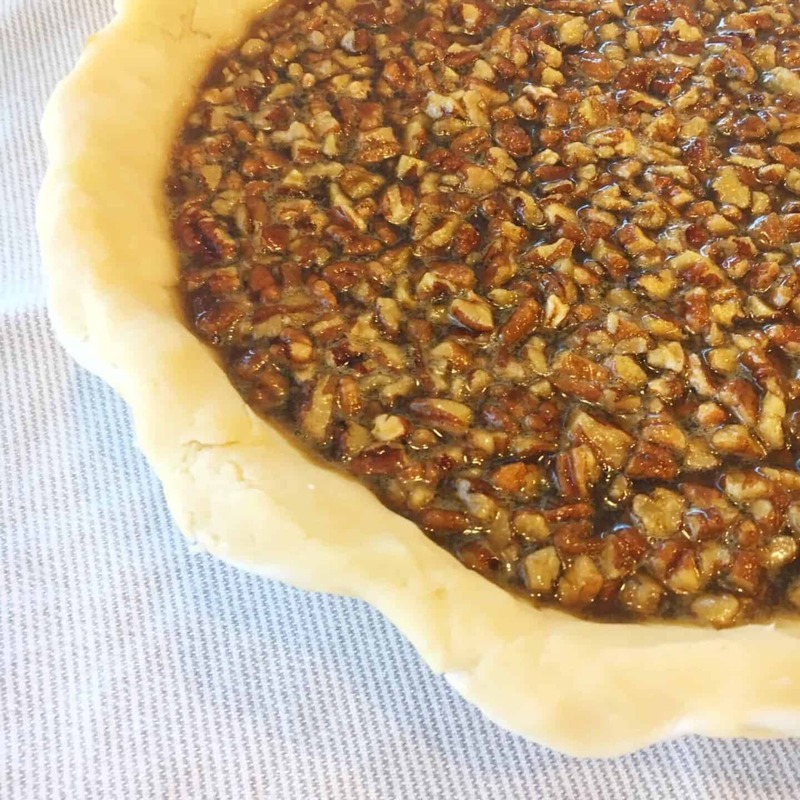 Scrape filling into pie crust. Bake pie 10 minutes. 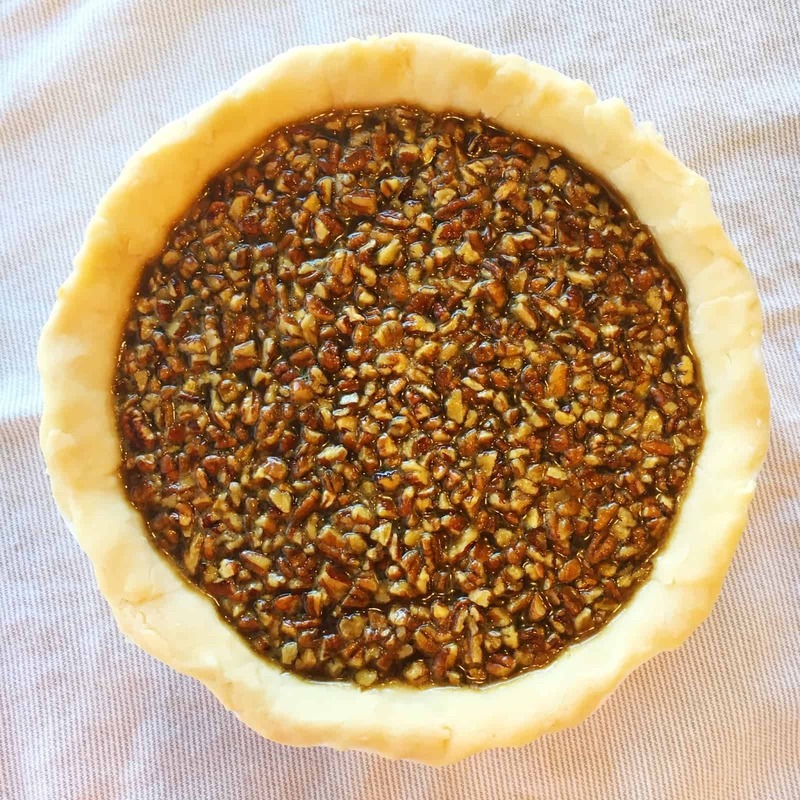 Reduce oven temperature to 375° and continue to bake until crust is golden brown and filling jiggles only slightly in the center, about 50 minutes. Transfer to a wire rack; let cool. Chill until firm, at least 4 hours. Remove from fridge at least 1 hour before serving. Next Post Corey’s Nautical First Birthday!